Talking about winners in the evening news game is a little like talking about the luckiest slot-machine addicts: the long-term odds do not work in their favor, no matter how far they're up at any given moment. But setting aside the quarter-century slide in aggregate audience, the succession of anchors at ABC, from Charles Gibson to Diane Sawyer, is good news for one competitor in particular: NBC. Brian Williams, at 50, is the youngest of the Big Three networks' anchors: two years the junior of CBS's Katie Couric, and 14 years younger than Sawyer. And while Couric's tenure has been punctuated by drama and speculation about an early exit, Williams seldom appears to be enjoying himself less than completely. That means that, unlike its two competitors, NBC can expect to have its anchor around for many years to come, in a business where continuity and familiarity are keys to stemming audience erosion. Meanwhile, despite claims that Sawyer "is taking dead aim" at Williams, she seems more likely to sap viewers from Couric. Both women come to the evening news from morning shows, suggesting that they have a similar constituency. (Read this Caitlin Flanagan article for a great explanation of how the two genres' audiences differ.) 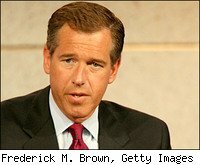 In this scenario, Williams -- a graying, middle-aged white guy, just like Gibson, Tom Brokaw, Dan Rather, and the late Peter Jennings -- serves, however improbably, as a piece of counter-programming.